The Track. Wet. This is the only flat part. What a wild ride this race was. I showed up at the race site with a lot of trepedation - I knew sign-ups were low, and the weather was going to be awful. Maybe +8C, and raining the entire race. I didn't know what to expect, at all. The venue was really excellent, spectacular. I've done a lot of races where everything was tents and porta-potties - here we had a first class building, washrooms, even a change room area. Not only that - the building looks out over the Grand Prix circuit, where the race would be taking place. Great for spectators who didn't want to brave the weather! And because the race was laps, you would see the racers pass over and over. 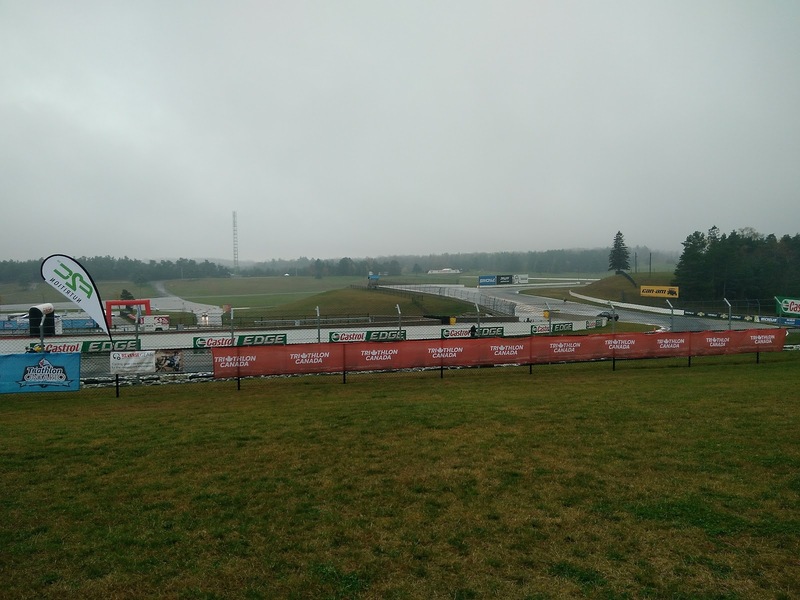 The Grand Prix circuit was wonderful too - it's one of the original natural terrain race circuits, with plenty of elevation change (more on that later) - and surrounded by trees. Fall colours, very pretty! Race organizers had everything sorted out top notch - lots of room to rack bikes, porta-potties, lots of parking. Nice bibs, chip timing. All top notch. We did the pre-race briefing in the rain, sprinkling, but constant. I looked around and was struck by just how good everyone looked... caught some bits of conversation, and it was clear most of the folks here were braving the weather to get qualifying spots for the World Duathlon Championships. This was pretty much confirmed when the race started and everyone took off, leaving me in the dust! Of the 20-25 participants I was 4th from last (and dead last of the men!). The run course started with a short hilly/rough 2.5km loop of the infield, followed by two 4km laps of the full Grand Prix circuit. The 2.5km was tough - steep climbs, some gravel. I tried to just keep within myself and not get left entirely in the dust. The 4km Grand Prix circuit was amazing, but there's about 100m of the 4km that are flat (I may be overestimating). The rest of the time you're going either up or down. The first half of the track is mostly downhill, then you get to Turn 5 at the far end and it's allllll uphill to the start/finish straight. I really enjoyed the run, just stayed within myself, didn't get too fussed about my position. The ride consisted of 10 laps of the 4km Grand Prix circuit. I was pretty tentative at first - we'd been warned it was slick out there, and last thing I wanted to do was crash. I do enough of that on my mountain bike! The climb on the backstraight... oh my gawd, it was tough. The first time through I was in a bit of a not good place, and my low gear didn't seem spinny enough for it. It hurt! Second lap I had gained a lot of confidence. I noticed my descending was awesome compared to most of the people I found around me. Guys who flew by me up the hill couldn't match my pace descending - I had a road set-up (not a TT set-up) and the bike just felt awesome under me. I barely braked at all on the lap, used my momentum downhill to get up the other side as much as I could! During my 6th lap, someone passed me and made a comment about how tough it was. I said "if I never go up this hill again it would be too soon!" So imagine my surprise when, at the end of the 6th lap, they were diverting us into the transition! 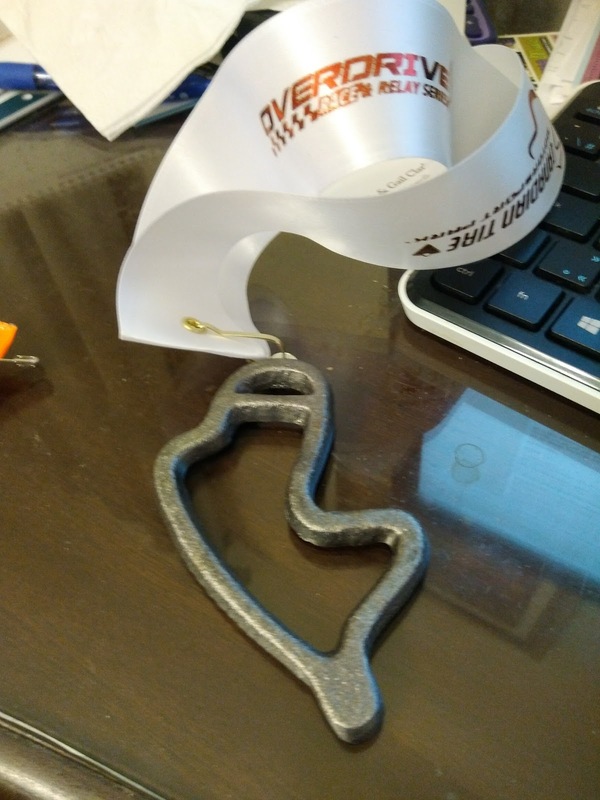 I told them "I haven't finished 10 laps yet"... but apparently the race director and the Triathlon Ontario folks had decided it was too dangerous due to the cold. Some folks had hypothermia or something. My immediate reaction was to be a little pissed... the weather was not unexpected, if people didn't dress for it, isn't that on them? But on the other hand it's pretty unusual to run duathlons this late - the crowd wasn't like the hardened Paris to Ancaster crowd that expects snow and what have you. So I get it. Frankly in that weather I'd pretty much had my fill anyway. This run was two more loops of the infield circuit. I hadn't really finished my nutrition plan, and my pacing was assuming 4 more bike laps, so I was kind of thrown off at first. I figured I'd drank enough to just forgo any more liquids and finish - so that's what I did. It was a little weird - I had no idea at this point who I was racing and who I wasn't. Was the person catching up to me someone who had done the same number of bike laps? More? Fewer? There was just no way to know. As I started my last lap, I caught up to one lady and passed her - and spotted another lady about 400m behind me. I knew she'd been catching me steadily as she hadn't been there before... so I got some fire in my belly. I wanted to hold her off, this became my new goal. Less than 1km from the end I could hear someone behind me. Footsteps, getting louder. CRAP. ... except it wasn't her, it was some dude, one that clearly had a LOT of pace, so not someone I was really racing against! Whew. Except at that moment I looked over my shoulder - and there she was. We were going uphill, she was closing in. I could hear her getting closer. I tried to find another gear, it wasn't there. As we finally got to the top of the hill I could tell she was right behind me... but now we were close enough I could tap into that anerobic stuff that I had left and finish strong! So I did - I put it all out there and sprinted to the finish. Totally cool medal - the Grand Prix circuit map! The medal is so awesome. At least for me - as someone who loved the circuit before I ever arrived, having gone to a bunch of car races there... really neat! Triathletes wrap up in September - this was just too late to draw a decent crowd. I heard guys talking about it after, they had a hard time keeping their training going to hit this race with anything. And the weather can be awful - in this case, it was really, really awful. It made it memorable and epic - but not everyone likes this kind of memorable and epic. An evening in June or July that doesn't conflict with another multisport event and it could work. The venue is great, the event well organized. Exceeded my expectations. 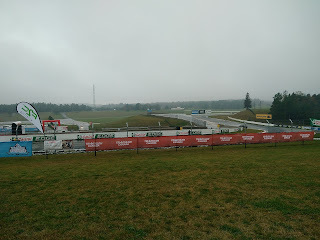 And best of all I finally got to ride the Grand Prix circuit at Mosport! I've wanted to do that since I first saw it.